(a) Install a new gasket to the intake manifold. (b) Install the fuel tube bracket with the bolt. 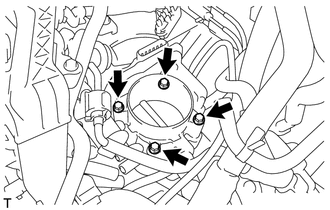 (c) Install the throttle body assembly with the 4 bolts. 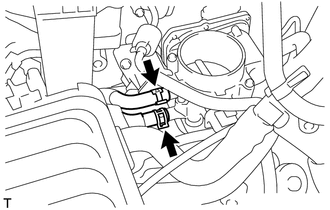 (d) Connect the 2 water by-pass hoses to the throttle body. 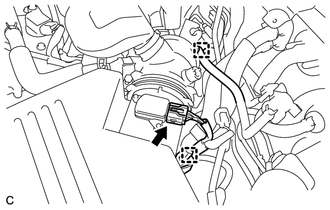 (e) Connect the throttle body assembly connector. (f) Connect the fuel tube to the clamp. 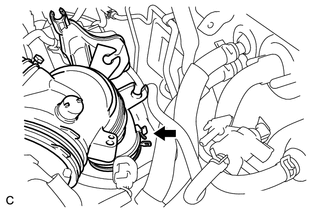 (a) Connect the air-cleaner cap sub-assembly to the throttle body assembly and lock the hose band. 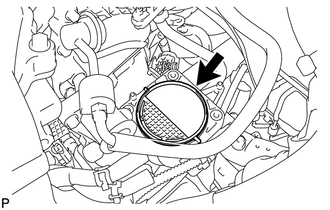 (b) Install the air cleaner cap sub-assembly with the 2 bolts. 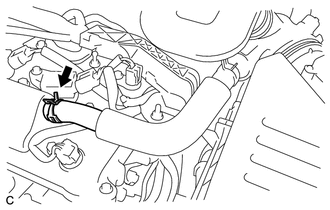 (c) Connect the ventilation hose to the cylinder head cover. (d) Connect the mass air flow meter connector and install the wire harness clamp to the air cleaner cap. (e) Install the hose to the hose clamp. (a) Install the windshield wiper motor and link (See page ). 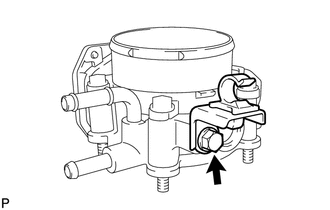 Perform the following procedure after replacing the ECM, throttle body assembly or any throttle body components. 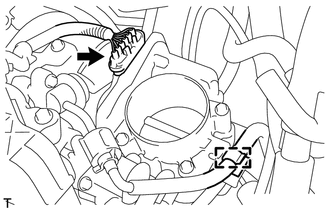 The following procedure should also be performed if the throttle body is cleaned. (a) Turn the ignition switch to ON without operating the accelerator pedal. 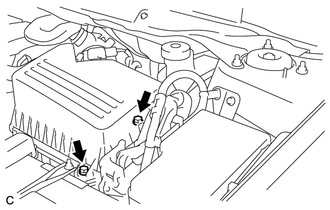 If the accelerator pedal is operated, perform the above steps again. (b) Connect the Techstream to the DLC3 and clear the DTCs (See page ). (c) Perform the "Inspection After Repair" (See page ). (d) Start the engine and check that the MIL is not illuminated. After the engine is warmed up, check that the idle speed is within the specified range when the A/C is switched off. Be sure to perform this step with all accessories off. Make sure that the shift lever is in N.
(e) Enter the following menus: Powertrain / Engine and ECT / Data List / Throttle Sensor Position. Sensor Output. Fully depress the accelerator pedal and check that the value is 60% or more. (f) Perform a road test and confirm that there are no abnormalities.